Today we have an interview with John Jordan who placed 2nd in the latest Adonis Index Transformation Contest. This is how you gotta show up to get second place. You don't have to pay for a studio and a professional photographer if you don't want to; you can take great pictures at home. John’s transformation was quite impressive and he has a reason to be happy and proud of himself. At first he wasn’t sure what to expect, but since he worked out really hard, followed his diet plan and did everything he could to show his hard work in his photos he placed second in the transformation contest. And it’s absolutely natural to have doubts about your progress and not be sure how you are going to end up. Especially if you have never done anything like this and you really have no idea how well you will look once you lean out and get a tan. The only way to find out is to do your best, take the pictures and see. You can’t really tell a lot at the beginning, you may start seeing some minor changes about a midway through, however most people see the results right at the end in the final week. And if you don’t have much to go, maybe just a couple of pounds to lose, build a bit of muscle and basically get photoshoot ready, you won’t necessarily notice any changes on daily basis. You see yourself in the mirror all the time and those daily changes will be subtle and require patience on your part. …But when you take the final pictures after 12 weeks that’s when you get blown away by the overall change. One of the few metrics or tracking tools you’ve got that can help you determine whether you are building more muscle or not is an increase in strength. Strength usually comes first followed by a change in the size/shape/look of your body. You can be strong without necessarily gaining more muscle at first. Gaining strength means that you are on the right track and will ultimately translate into visibly more muscle mass. John says he didn’t feel any change at the midway point of the contest…then he noticed some really good strength improvements in the gym. That feeling of strength helped him stay the course and push through to the end of the contest. How many pounds did John gain? 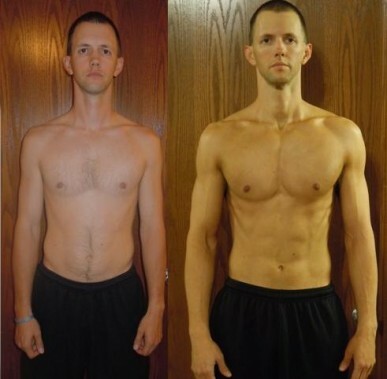 Not how many pounds of muscle, but how much heavier do you think he is in his after pictures? Really…pick a number before reading any further, you might be surprised by the actual answer. So, how much do you think? And remember we are talking overall weight, not muscle alone. Well, whatever number you had in mind, it was wrong. Because he didn’t gain any weight, not a pound. John actually lost several pounds to get to this shape. That being said, it doesn’t mean he didn’t gain any muscle at all. The point is that to look really good, you need to gain only few pounds of muscle, not 20 or 30 like some supplement claims say, which in most cases is impossible without any pharmaceuticals. A few pounds of real muscle gained in the right places and in the right proportion will make an incredible difference. Most people don’t even realize how much or how big one pound of muscle can actually be or look like. Little note, next time you go to a grocery store, take a pound of steak and put it next to your arm to really see this. Once you see that that pound is the size of your whole biceps you will understand that expecting to gain 30lbs of muscle is a bit ridiculous and the only people that can gain so much are in their teens or early 20’s and have never worked out before. And since John got totally shredded he had to lose several pounds. Without boring you with the math now, when you’d calculate this he actually LOST WEIGHT to get to the shape in his after pictures…even though he looks significantly bigger and most muscular. This is the illusion of leanness and well-proportioned muscles. Once you get in shape and really lean…six pack lean, when other people will see you without your shirt they will constantly guess that you weigh more than you do. The goal isn’t to actually BE heavier, it’s to LOOK heavier. The concept of a fitness contest was completely new to John, but he was so impressed with the transformations of the previous winners that he decided to jump right in and give it a try. 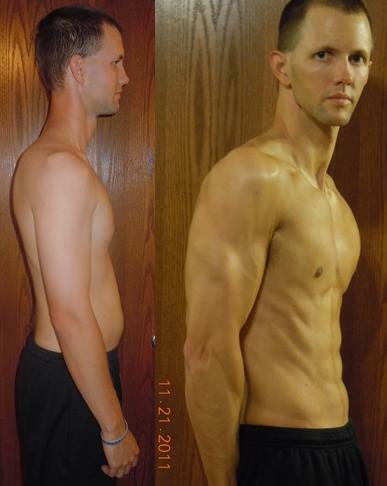 In the entire 12-week challenge he never missed a workout. He understood why he was doing what he was doing. He always woke up at 5am and did the workout first thing in the morning, so he couldn’t make excuses about being tired later in the day. He followed the Muscle Building Foundation from Adonis Index Workout, trained from Monday to Friday and took the weekends off. Before AI, John had no rest time incorporated in his workouts. This time he had a pretty specific program and like he said he did way better on a fully designed workout that gave him exact amount of seconds in between sets, so he wouldn’t rest for too long. He improved week after week, and for the first time in his life he viewed the time spent in the gym as “training” and not just a workout. At the end he showed everyone his pictures and got great feedback from his friends and family. His mother told him that she is glad he is doing something healthy for himself. His sister noticed he lost weight, was really impressed with his results and wanted to know how he did it. Adonis Index Workout – Here are the original workout plans that have been responsible for some of the most amazing transformations online.